The post Android P adds calendar events to lockscreen for some users appeared first on MobileSyrup. 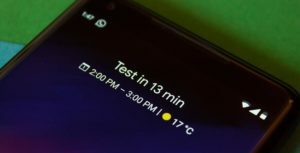 Android P developer preview 2 is bringing the Pixel’s ‘At a Glance’ widget to the lockscreen for some users. At a Glance was introduced as part of the launcher on the Pixel 2. The feature was later put into the Google app as a widget users could add to their home screen. The widget is still labeled as in beta. The widget shows upcoming calendar events, weather and the date. The addition to the lock screen is great and gives users a quick way to view upcoming events. However, the feature only seems to be showing up for some users, similar to viewing weather on the lock screen. Unfortunately, there doesn’t seem to be a way to force the widget to show up on the lock screen. No one here at MobileSyrup has the feature, either. This shift is part of a slew of small changes Google is making to the always on display in Android P. Along with adding the weather, Google has also centered the notification text and shrunk the clock when displaying notifications. Always-on display shows the battery percentage now as well. Taking the time to add these small details really helps Android P feel a lot better. Showing the battery percentage on the always on display isn’t a significant change, but now that I have it I can’t imagine going without. These always on display tweaks are just a small part of the changes Google is adding to Android P.